As we successfully expose the animal agriculture industry for its cruelty and environmental impact, the clever industry marketers keep reacting with more “humane” labels, more small-scale tall tales, and more feel-good falsehoods. It has never been more important to educate on the truth behind the industry lies. Bringing together a knowledgeable panel of experts on this issue, we hope to expose animal agriculture’s humane-washing with fresh insight into the humane hoax. Please join us in January for this exciting free event! Hope Bohanec has been active in animal protection and environmental activism for over 25 years and published the book The Ultimate Betrayal: Is There Happy Meat? 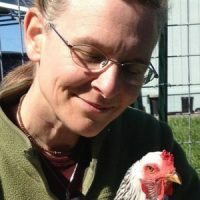 She is a nationally recognized leader and speaker in the animal protection movement, and serves as Projects Manager for United Poultry Concerns. Hope is also the Executive Director of Compassionate Living, a Sonoma County, California based vegan advocacy organization. Before this, Hope offered her organizational talents as the Campaigns Director at In Defense of Animals. Hope is the primary organizer for UPC’s annual Conscious Eating Conference at UC Berkeley as well as the Sonoma County VegFest and the Berkeley Earth Day. Justin Van Kleeck has a Ph.D. in English and is a freelance writer, educator, and community organizer. 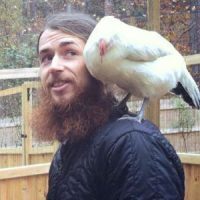 Justin spends most of his time working at the Triangle Chicken Advocates microsanctuary, which he and his wife founded in 2014, and which inspired them to start The Microsanctuary Movement later that year. He also founded and contributes to the radical vegan blog Striving with Systems. Justin currently serves as the Sanctuary & Microsanctuary Advisor for A Well-Fed World.